If you're reading this webpage, you're probably searching for a simple, straightforward and cost effective way of backing up Windows Server 2008, SBS 2008 or EBS 2008 and Server 2008 R2. And you may be trying to use the image backup that's built into the Operating System itself, but you've run into one of the many roadblocks or encountered some of the limitations that Microsoft overlooked... perhaps you're frustrated at the poor hardware support, lack of email reporting or lack of user-friendly media rotation... and that's forcing you to consider other options. If so, then BackupAssist is the answer! Gives you confidence with email reporting, improving reliability and visibility. Perhaps the most important aspect of a backup system is being notified that the backup took place so you can have confidence in the backup system's performance, and be notified if and when errors occur. Another problem is that the built-in wizard removes the drive letter of the backup device so you cannot even see what is on the device! BackupAssist fixes these problems by showing you how much backup data there is, and what past backup versions are on the device. Unfortunately, the built-in wizards in Server 2008 will only allow you to schedule a backup to a USB or Firewire connected device. If you want to back up to other devices, such as NAS, eSata disk, local disk, rdx drive or REV drive, you either have to "backup once" (a manual process) or script wbadmin.exe yourself. BackupAssist gives you the solution. It allows you to schedule backups to all these devices, and do so with no additional configuration. In addition, BackupAssist allows you to see the contents of the backup device (it keeps the drive letter), and it manages things like "Safely remove hardware" and "Add new hardware" to both eject and inject devices to make sure that the backup runs. Additionally, it will also cater for situations where a USB drive's drive letter changes. No scheduled backup support for non USB or 1394 HDDs. Wide range of devices supported. Specific hardware support for each device. The concept of media rotation involves having multiple backup devices in a "pool", and swapping these devices onsite and offsite. The purpose is to have a variety of restore points, and to have them stored in different physical locations. Unfortunately, the in-built Microsoft wizards provide you with absolutely no help in managing this process. It allows you to add devices to a "pool", but leaves the rotation process entirely open. This means that you need to devise your own strategy. With BackupAssist, you can choose from pre-defined best practice media rotation strategies at the click of a button. For example, if you have 5 backup drives, you can easily configure to rotate them as 1 monthly, 2 weekly and 2 daily disks. 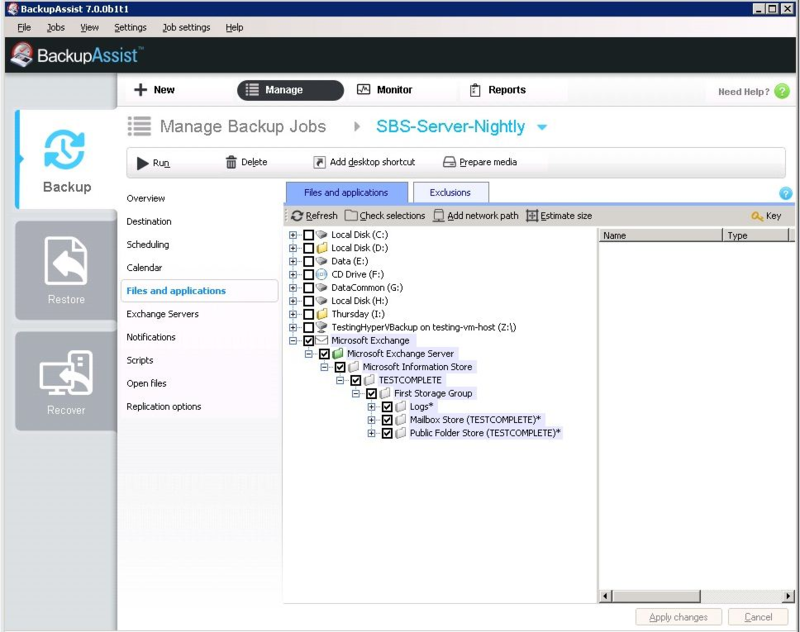 And BackupAssist will even send your backup operator an email every day to tell them which disk to connect, and check that the correct disk was connected at the time of the backup! This minimizes human error and enhances the reliability and effectiveness of the entire system. No concept of media rotation. User is left to his/her own devices. 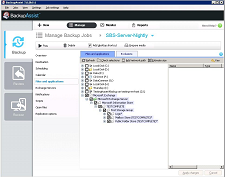 BackupAssist includes fully integrated support for VSS application backup and restore. Microsoft applications such as Exchange Server, SQL Server, SharePoint and Hyper-V are all fully supported, as well as any other VSS-aware application that uses standard VSS restore methods. Local VSS-aware applications can be safely backed up and restored without you having to manually choose the correct files. All running VSS applications will be automatically detected and listed for selection. Simply choose the VSS application that you want to back up from the list of detected applications. If you are running Server 2008 R2 you can even drill down and choose individual components (databases, storage groups, etc) to backup. Application restore is just as easy using the BackupAssist Restore Console: browse the contents of a backup and select the application(s) you want to restore. No way to easily select VSS applications for backup. Need to make sure that the correct application files are selected. Select individual application components on Server 2008 R2. Simple VSS application restore using the built-in BackupAssist Restore Console. If you are running Windows Server 2008 R2 you can select individual files and folders stored locally for backup. If you are running Windows Server 2008 you can only select entire local volumes for backup. However, BackupAssist also gives you a solution for Windows Server 2008 and earlier operating systems at no extra cost. The BackupAssist File Replication Engine provides a separate backup method that allows you to copy files, complete with VSS support and full NTFS security / extended data stream support, from any location to any other location. No file-based backup available on Server 2008. Only entire local volumes. Restoring from a particular backup - specify the backup job and date to recover files and folders. 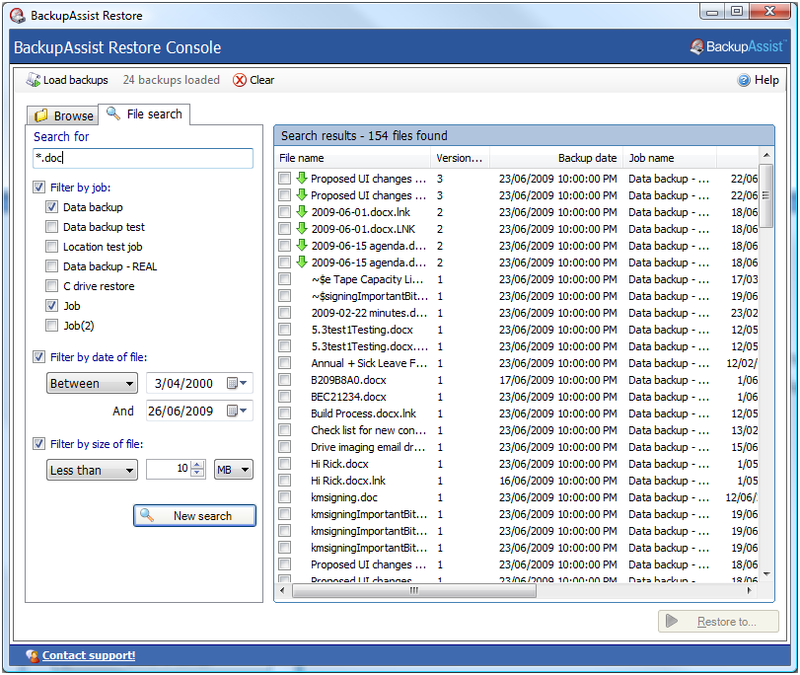 Free search - where you can search all your backups for particular files, see what version history you have for each file and restore one or more versions of the files you choose. You can also use the Restore Console to restore VSS applications (Exchange, SQL, SharePoint, etc) and the System State (from image backups created on Server 2008 R2). No easy way to search for files across all your backups. No way to restore individual files on Server 2008. Free search utility to locate particular files across all your image backups. Easy to restore VSS applications and System State. Free 30 day trial - eliminate wbadmin headaches today!